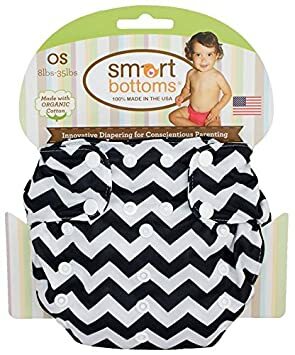 I love getting to try new cloth diapers and the Smart Bottoms Smart One Organic AIO is my newest! So far I'm in total love! I got it in the Finch color and also received a pack of their wipes to try as well. Love the nice thick elastic in the back, it really holds stuff in! It has the long, fold over style soaker. You fold it where you need the absorbency and snap it on. A great fit on my little/not so little man! It is ridiculous how trim this AIO is!! 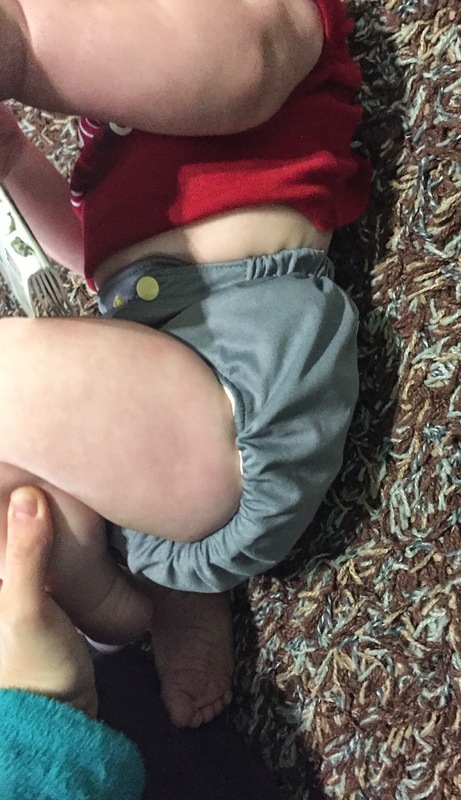 Most AIOs are super bulky and take up a lot of space, but this diaper is super trim and that's because of the organic cotton, it's a trim material but is really absorbent. I however, don't think this diaper is real absorbent. I know that it gets more absorbent with washes but I've already washed it close to 10 times and it's just not as absorbent as I'd like. But because of the trimness, I put a booster in with it and then it becomes the ultimate diaper. Still trim, really absorbent and an all around great fit. But as a diaper on it's own I don't think it's real absorbent. The wipes are great. They get the job done, they are super soft and are really large so they cover a good area of your hand! The diaper is meant for 8-35 pounds and I definitely think this is a good range and that it will fit that long. My hunker is 19 pounds and still has one more rise snap to go, so I think we will be able to wear this until potty trained. Best part though is all their products are made in the USA 100%!!! Price: The AIO is $25, but it is definitely worth it! My little girl would look so cute in Emerson! I like finch a lot. Grey colors are starting to grow on me. I think I would choose the Epic. I love the Finch color. I really like the Finch color demo-ed. Very pretty! I like the purple in mia and monster. We don't have a Smart Bottoms yet. I'd love a Finch! I really like the finch, the color of the snaps is my favorite color. The AIO in "emerson" is so cute! I would love the George color. I love the colors in Monster! I'd pick George or Finch. If I won I would either pick the red one with green snaps or the cow pattern one! Thank you! Also, in the last entry form the link to the giveaway is not working for me. Is anyone else having issues with it? Thanks! I like the Epic pattern diaper! Most definitely the tie dye diaper!!! The tie dye print is my favorite! Emerson is my favorite print!! I like the finch one. LOOOOOOVE the Juliet, such a pretty color! My favourite prints are Gorilla Blue and Epic. I also like that cow-like print but I can't seem to figure out the name of it... But I think Gorilla Blue might be my fave of those three in any event. :) So cute!!! I can't decide for sure, I'd get either Mia or Tie Dye. I love the frozen color. I would choose that if I won. I would pick Tie Dye! I like limelight a lot! I like the Gorilla Blue. Gorilla blue and finch are my top two favorites! but I really like all. I have never tried Smart Bottoms before. I would pick the Tie Dye. So cool! I would pick the Tie Dye color! So Cute! I can't get enough pink and purple diapers for my little peanut! I would choose "Rocket" for my baby boy due in the spring. I would love the black and white giraffe looking print. I would choose epic or tie dye . I love the Tie dye print or of the solid colors I would choose Finch. I would choose the tie dye one! Super cute. I would choose the tie-dye! I would choose Emerson or one of the upcoming new prints like unicorn! I would pick either electric (is that black? their website was being weird) or gorilla blue. I would pick Emerson or Finch. id love the 3.1 in juliet! I would choose FINCH! So pretty! I think I'd either choose Finch or tie Dye. I'd probably pick Tie Dye! I love the Finch and the Fox that hasn't been released yet! I would choose the tie dye print. I would choose the color called Frozen. The finch looks great to me! The 3.1 in finch, all of them are cute! If I were to win this giveaway I would choose the SmartBottoms Smart One 3.1 in Epic! The print is so cute and gender neutral! I love that it is an AIO and fits 8-35lbs. That s plenty of wiggle room for babies to grow! i would choose either Mia, or Frozen! I would pick the Emerson, so cute.